Parental care for a child with a developmental disability is an enormous responsibility, one that can far exceed that of typical parental care. While most parents adapt well to the situation of caring for a child with a disability, some do not. To understand parents' adaptations to their children's disabilities, the complex nature of stress processes must be accounted for and the constructs and factors that play a role in the caregiving must be considered. Evidence suggests that there is considerable variation in how caregivers adapt to their caregiving demands. Many studies have sought to qualify the association between caregiving and health outcomes of the caregivers. Contextual factors such as SES, child factors such as child behaviour problems and severity of disability, intra-psychic factors such as mastery and self-esteem, coping strategies and social supports have all been associated with psychological and/or physical outcome or parents or primary caregivers. In reviewing these issues, the literature appears to be limited by the use of traditional analytic approaches which examine the relationship between a factor and an outcome. It is clear, however, that changes to single factors, as represented in these studies, occur very rarely even in the experimental context. The literature has also been limited by lack of reliance on specific theoretical frameworks. This conceptual paper documents the state of current knowledge and explores the current theoretical frameworks that have been used to describe the caregiving process from two diverse fields, pediatrics and geriatrics. Integration of these models into one comprehensive model suitable for this population of children with disabilities and their caregivers is proposed. This model may guide future research in this area. It has been estimated that about 10% of children experience developmental disorders requiring access to the health care system and extensive caregiving, often throughout childhood and into the adult years. The cerebral palsies (CP) are one such chronic condition, and can serve as a prototype of childhood disability. CP presents in early childhood as a set of functional limitations that stem from disorders of the developing central nervous system . The current estimated incidence of CP is 2.0–2.5 per 1000 live births[2, 3]. Although impaired motor function is the hallmark of the cerebral palsies, many children also experience sensory and intellectual impairments, and may have complex limitations in self-care functions such as feeding, dressing, bathing, and mobility. These limitations can result in requirements for long-term care far exceeding the usual needs of children as they develop, or the expectations of their families as they parent[4, 5]. Thus while caregiving is a normal part of being the parent of any young child, providing the high level of care required by a child with long-term functional limitations can become burdensome and may impact upon both the physical and psychological health of the caregiver. For each individual there may exist a number of psychosocial mechanisms that regulate the impact of stress on health and well-being. The characteristics of the caregiver, the recipient of care, their shared history, and the social, economic and cultural contexts within which they find themselves combine to create an infinite variety of circumstances from which stress may both originate and be managed. Nonetheless, there are implications arising from the role itself that help to explain some of the common patterns of stress and stress outcomes (e.g., deteriorating self concept, decline in emotional well being) in caregivers. Individuals typically occupy multiple roles in life, such as family roles and occupational roles. Becoming a caregiver of a child with long-term disability introduces an additional role, and therefore will require some rearrangement of priorities, and redirection of energy. Not only is this likely to produce strain at a personal level, but it is also likely to spur reactions (potentially negative) from various people who are interconnected to a person through his or her roles outside the realm of caregiving. Thus stress can be understood to arise at the level of provision of care, as well as in other areas of life. Much of the literature tends to focus on stress related to direct provision of care, however, as Aneshensel et al. (1995) suggest, it is important to recognize stress occurring in the broader social context in order to gain a complete understanding of its scope and effects. Over the past two decades, family units have become smaller and the rate of marriage breakdown has increased. In the same period, with the technological advance in medicine, the survival of children with disabilities has risen. The shift of healthcare to ambulatory and community-based care settings may serve to increase demands on family members, necessitating that they be more active participants in the care of their child. This combination of factors leaves smaller family units shouldering the responsibility for increased caregiving demands, making the task of understanding and providing for the needs of the caregiver more important. As reported in both the scientific and lay press, those experiencing what has been called the unexpected 'career' of 'caregiver for a child with a disability' may experience a multifaceted, complex and stressful life situation that can have important consequences if the health care and social service systems cannot recognize these issues and assist such families. Like an occupational career, the notion of a 'caregiver career' connotes a dynamic process, where an individual proceeds through a sequence of stages, necessitating considerable transitions and restructuring of responsibility over time. For a caregiver, these stages include preparation for and acquisition of the caregiver role, enactment of the associated tasks and responsibilities, and eventual disengagement from the role. Many patterns of change also exist within these stages, such as the need for increased assistance with activities of daily living (ADLs). This metaphorical description of the caregiving experience provides a useful way to consider the predicaments that many families may experience as they raise a child with chronic problems of health or development. Note, however, that the 'caregiver career' differs from an occupational career in several important respects. Becoming an informal caregiver is not typically chosen or planned; people do not often envision being in a caregiver role when they project themselves into the future. Thus, preparation for this role will most often occur once it has already been acquired. In addition, an informal caregiver lacks the rights, privileges, and prerogatives that come along with a formal career status. This is not usually a career recognized by society as a worthwhile pursuit. The role also differs from occupational careers in that progression along its pathway is driven not by ambition, but rather by the progression of the disorder and the functional dependencies it creates. Finally, unlike an occupational career choice, the caregiving career cannot be entered into and left at one's own will. The relationship between caregiving and health is described generally in terms of stress. Aneshensel et al. defined stressors in the context of caregiving as "the problematic conditions and difficult circumstances experienced by caregivers (i.e. the demands and obstacles that exceed or push to the limit one's capacity to adapt)". Emphasized in this conceptualization is that stress originates at an intersection between one's external environment and internal state; it arises "when the demands imposed by a patient's condition collide with a caregiver's subjective ability to respond, or when these demands obstruct the pursuit of other objectives". This intersection between the individual and his or her environment serves to explain why some caregivers seem less affected by caregiving stress, while others experience more deleterious health outcomes. The potential compromise of caregiver health brought on by the demands of the role is poignantly exemplified in a well-publicized Canadian story (known as the Latimer case) where a father had taken the extreme action of killing his child with a disability. The father's explanation for committing this act emphasized the feelings of stress he experienced related to taking care of his child, the child's degree of pain, and his sense of helplessness regarding the future life his child would have. This case caused a considerable amount of controversy between two coalitions: those representing the rights of people with disabilities and those who believe that "mercy killing or assisted suicide" is sometimes justified. The case was finally resolved through the Supreme Court of Canada and resulted in a charge against the father of second degree murder with a 10 year sentence. The court upheld the principle that every individual's life, with or without a disability, is to be treated equally in society and receive the full protection of the law. It is interesting to note that this decision did not receive popular support as the majority of people polled felt the decision was wrong, that killing his daughter was excusable based on the consequences of her disability. This is a strong reflection of the public's perception that caring for an individual with a disability must be extremely stressful and not necessarily worth the effort. What are the mediating factors in the stress and time demands of caring for a child with a disability? Why do some families cope very well and others less well? To understand parents' adaptations to their children's disabilities, it is necessary to take into account the complex nature of the stress process and attempt to describe the constructs and factors that play a role in the caregiving experience. Theories guide research and in turn, research results modify theories. To begin the task of understanding the complex processes of caregiving, current research evidence must first be considered critically and objectively, to provide an up-to-date foundation of knowledge and to identify limitations. This includes identifying and addressing areas of research beyond childhood developmental disorders, in particular the literature on the challenges faced by adults caring for a functionally dependent spouse or parent, in which a substantial branch of research is focused on the needs and health of caregivers. Existing theoretical models describing caregiver health must be examined, and then critically considered with respect to the current state of evidence. Development of a conceptual model attempting to explain health of caregivers of children with disabilities can then be accomplished through synthesizing and building upon these current frameworks to provide a more comprehensive picture of the multi-factorial nature of caregiver health. The objective of this paper is to document this process of evidence review and model creation. Relevant research will be reported and current conceptual models discussed. Based on this literature, a new conceptual model will then be proposed which is amenable to testing through empirical research. With this new model we hope to predict profiles of stress situations and thus identify vulnerable families, as well as factors that mediate the experience of stress and moderate the impact of childhood disability on parental well-being. This should make it possible for services to be targeted to help ameliorate these situations before the health of those providing care becomes seriously compromised. Most of the studies conducted in this field of parent well-being in the context of chronic childhood impairments involve a survey with a variety of questionnaires, or either structured or unstructured interviews conducted with caregivers. The present review was not intended to be comprehensive. The review only included studies that were published in English in peer-review journals. The search was performed on following four databases: (1) MEDLINE, (2) CINAHL, (3) PsychINFO, and (4) Sociological Abstracts. These databases were searched from their date of release to the end of 2002. The search was conducted using combinations of the search terms and included terms such as "caregiv*" or "care giv*" or "parent" or "mother" or "father" or "informal care", "child health", "child disability" and "pediatrics". In addition, we also examined the reference lists of all included papers to identify any additional articles that might have been missed by our search strategy. Table 1 summarizes studies examining the factors involved in caregiver stress. However, we have also explored the key studies from the geriatric literature to identify factors that might be relevant to the caregiving process in a pediatric population (Table 2). Evidence suggests that there is considerable variation in how parents adapt to this caregiving demand[9, 10]. Some adapt well to the challenges of caring for a child with a disability, while others do not. The typical outcomes studied relate to caregiver physical and mental health, their well-being, as well as their ability to maintain their social roles. Significant associations were found on difficulty of and time devoted to caretaking, number of tasks with which fathers helped, and satisfaction with support from family, friends, and community groups. 41 infants, 21 with a disability, 20 without and their mothers (varying diagnoses) Multiple time survey. 11. 15, 19 and 29 mos. Depression in mothers related to child characteristics or social support. Virtually all studies report elevated levels of depressive symptoms among caregivers. Many studies have sought primarily to qualify the association between caregiving and negative health outcomes. Cadman, Rosenbaum, Boyle and Offord (1991) found parents of children with disabilities were more likely to experience depression and distress than parents of children without disabilities. Another study found that caregiving for a child with a developmental disability places increased demands on the caregivers. Dyson (1993) confirmed significantly higher parental stress in parents of children with disabilities, who were also found to have pessimism regarding the future. In addition, the parents' perception of how difficult it was to care for the child was related to feelings of depression. Much of the research has focused primarily on mothers of children with a disability. It has been shown that these mothers are more stressed than mothers of children without disabilities due to the extra daily tasks which take away time from the mothers to take care of themselves. Dunst, Trivette and Cross (1986) also found that mothers of children with disabilities reported poorer emotional and physical health and that they felt that there were greater demands on their time from the child. Gowen, Johnson-Martin, Goldman and Applebaum (1989) similarly reported that mothers of children with disabilities had more difficulty caring for their children and that they felt that they could not find enough time for themselves due to the increased daily demands associated with caring for a child with a disability[14, 17]. The literature supports a link between context, especially socioeconomic status (SES), and health [18–21] but results have been mixed concerning the physical and psychological health of the caregivers. In the literature concerning caregivers of the elderly, lower SES, age, and marital status of the caregiver have been shown to be linked to psychological health of the caregiver[22, 23]. Higher SES has been associated with fewer psychological life stressorsand better emotional well-beingin caregivers of children. It is of course recognized that the SES is but one of several important indicators of the context. In terms of how child characteristics have been shown to modify the health outcomes of caregivers, most findings concern psychological health of the caregiver. King et al. (1999) found child behavior problems to be the single most important predictor of caregiver psychological well-being. Children's temperament has been related to feelings of depression in the caregiver and to self-rated scores of well-being and competence in mothers of children with disabilities. Furthermore, severity of the disability has been repeatedly shown to be related to parental stress [26–30]. Other variables relevant to caregiver psychological health may include age and gender of the child, level of the child's communication ability, and the presence of specific cognitive or sensory impairments[11, 13, 27, 31, 32]. Literature examining intrapsychic factors has shown that caregivers' self-perception is related to overall caregiver health. Mastery is a concept addressing 'the general degree to which one experiences control over what goes on in his or her life' . This sense of mastery has been repeatedly shown to be associated with both physical and psychological health in a variety of populations [34–36]. Similarly, low self-esteem and 'loss of self' have been shown to be associated with maternal depression[35, 37]. A portion of the literature has investigated various aspects of coping. Friedrich et al. (1985) showed that caregivers in difficult circumstances but with relatively high social support managed better than those with less social support. The level of available informal social support has consistently been shown to be associated with both fewer reports of depression and better physical health in caregivers of the elderly[22, 23, 38, 39]. Satisfaction with social support networks has been associated with more positive caregiver attitudes and personal well-being[16, 24, 40]. In a study of 48 mothers and 48 fathers of children with disabilities, Frey, Greenberg, and Fewell (1989) determined that "positive belief systems, or a non-critical family network" were associated with low psychological distress in mothers, and that social network predicted family adjustment. Social support was investigated by McKinney and Peterson (1985), who identified peer support as one of the most important predictors of stress, while Dunst, Trivette and Cross (1986) demonstrated that parents who had more satisfaction with social supports reported fewer emotional and physical problems. Family functioning and stress management have also been shown to serve as coping factors[9, 41–43]. Freidrich (1979) showed that marital status was the best predictor of coping for mothers of children with disabilities, indicating spousal support as a coping factor. This was supported by Erikson and Upsur, (1989) and Lambrenos et al. (1996)[31, 45]. Specific stress management strategies can be associated with better caregiver health [27, 46]. Most of the current broadly-based studies investigating caregiver health in the child health literature do not rely on any specific theoretical frameworks that guide research into an understanding of the mechanisms by which some caregivers experience negative consequences and other do not. The majority of the published research has focused on understanding hypotheses using traditional analytical approaches that examine the relationship of a factor to the outcome after adjusting for other variables. However this method has many shortcomings. This type of study is used primarily to estimate the "independent" or direct effects of childhood disability on the "dependent" variable, in this case caregiver health. However, single factor changes are relatively rare outside of the context of a natural or laboratory experiment, as are the assumptions of linear, additive relationships and perfect measurement which are inherent to regression analysis. Moreover, few regression-based studies look specifically for possible contingent relationships among explanatory mechanisms; regression analyses will typically assume that such interactions do not exist. Although these studies have been beneficial in pointing to a wide range of possible mechanisms mediating caregiver health, they fall short of providing an integrated picture by failing to examine comprehensively the direct and indirect pathways occurring within this array of factors that may influence health outcomes. To understand the complex web of direct and indirect relationships that impact the health and well being of family caregivers, research needs to test hypotheses that are guided by theoretical frameworks, whereby these hypotheses can be tested using advanced statistical techniques such as structural equation modeling. The first model relating chronic illness and stress outcomes was proposed by Wallander et al. Wallander and colleagues were interested in explaining why there was a wide variation in the psychological adjustment of children with chronic physical illness. Specifically, they wanted to identify what was different about children with chronic illness in terms of risk and resistance factors (coping resources). The resistance factors are separated into three categories: stable person factors, stress processing factors and social-ecological factors. Wallander et al. suggest a process with changing relationships between the risk and resistance factors over time. Additional aspects within the risk factors category that may precipitate stress are identified, including those factors within the individual and the disability, the functional independence level of the individual and the factors related to living with a disability. Building upon the risk-resilience conceptual framework, King et al. proposed a model of factors affecting the health of caregivers of children with disabilities. This model adds to Wallander et al. by including a process-outcome framework. The variable of parent perception of the quality of outside care is added to the framework in relation to the prediction of parent well-being. There are four groups of terms, including prognostic indicators, professional caregiving, mediating variables and parental outcomes. The constructs within the terms are demographic factors, disability parameters, caregiving process, social-ecological factors, psychosocial life stressors, coping strategies, and the two outcomes, satisfaction with care and parent emotional well-being. The outcome of better parent well-being was associated with the perception of having received family-centered care, the presence of protective socio-ecological factors, fewer child behavior problems and increased satisfaction with care. Their results highlight the necessity of providing services in a family-centered framework that meets the parents' needs, and support the notion that socio-ecological factors directly impact parent well-being. 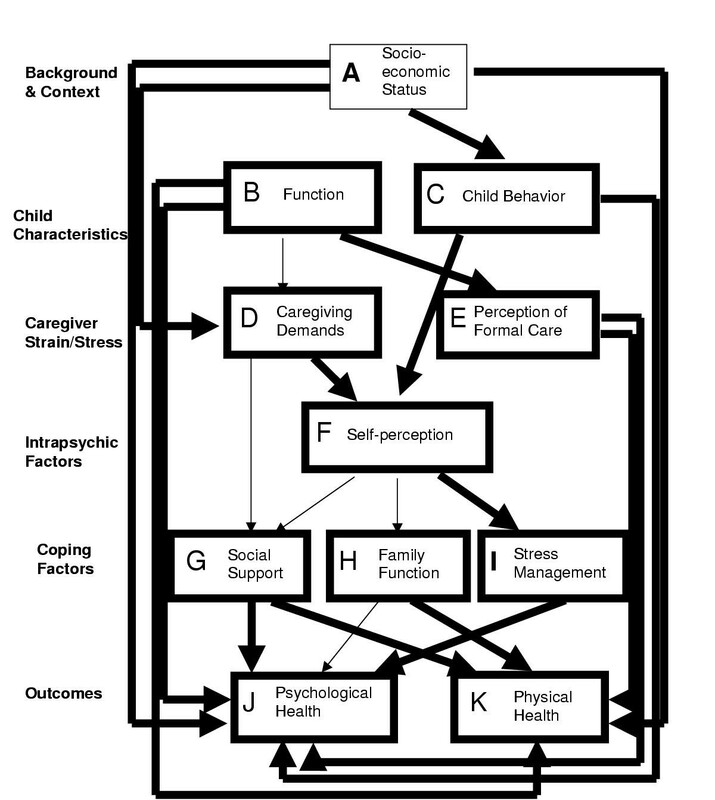 This model was designed to assess the informal caregiving processes affecting caregiver health[35, 49]. Similar to other models described above, Aneshensel et al. and Pearlin et al. applied the stress process model to the caregiving of older adults with dementia who at one point were independent but where the relationship had now changed to one where the caregiver was responsible for meeting all the needs of the older adult with dementia. As mentioned earlier, the caregiving experience and associated stress process reflects a process that changes over time. Pearlin and colleagues define stressors as the "problematic conditions and difficult circumstances experienced by caregivers" that strain or supersede the individual's capacity to adapt. These are conceptualized as primary and secondary in nature. The primary stressors are linked directly to the individual and the disability, while the secondary stressors arise from the demands of the caregiving role itself. The potential proliferation effects of the stress involved in the caregiving role highlight the existence of a complex stress process. This conceptualization allows for numerous instances for the moderators to impact the situation. The moderators include social supports and concepts of mastery or self-efficacy, which determine how people are impacted differently by the same stressors, and may help to sustain the caregiver and lessen the effect of the stressors. The manifestations of stress (outcomes) are well-being, physical and mental health and the caregivers' ability to sustain their own social roles[8, 50]. A considerable base of independent research literature supports each of these elements. Pearlin and colleagues recognize that the inter-relationships among these variables change and develop over time, however what has not been researched are the processes or linkages that join these components. The Caregiving Career/Stress Process model suggests that "life events can lead to negative changes in people's roles, changes whose persistence wears away desired elements of self-concept, and that through this set of linkages stress is aroused[51, 52]. Coping and social supports, for their part, can intervene at different points along this process, thereby mediating the outcomes.". A comprehensive multidimensional model based on previous research and theory is needed to guide future research in the area of caregiver health. It will allow the researcher to model not only the direct relationships between constructs of interest and the outcomes, but also the indirect effects through intervening constructs. e) Examining both physical and psychological health as outcomes in the model. The health of caregivers of children with CP will be used as a prototype, to demonstrate the application of the proposed theoretical framework within the broader category of 'developmental disabilities'. CP comprises a heterogeneous group of neurodevelopment disorders, ranging from 'mild' motor difficulties to an array of complex developmental and functional disabilities in children with more 'severe' CP. As a group caregivers of children with CP will likely experience a wide range of demands, thus allowing the theoretical constructs to be broadly applicable to families of children with many different developmental disabilities. The reason for focusing on caregiver health and well-being as an outcome rather a starting point in this model is based on the notion that these 'outcomes' are related to the children's 'primary' conditions. They are thought to be important targets for prevention; and they address an aspect of child health services that has traditionally be less well addressed by health care sector. The five constructs included in the proposed model are: background and context; child characteristics; caregiver strain; intrapsychic factors; and coping/supportive factors and health outcomes. Each construct categorizes separate factors influencing caregiver health, and is described in detail below, with reference to the existing literature. We acknowledge that there are many possible ways of thinking of the stress process and an infinite number of factors that could be considered. Building on the available literature we have selected those we felt were most relevant. This of course does not eliminate the possibility of adding additional factors, which can be included within the constructs of our model. The goal of developing and subsequently testing a complex model is to determine whether there are factors that are more salient in their impact on caregiver health and well-being, and whether this knowledge can assist in the planning of services to families with a child with CP in order to ameliorate some of the stress involved in this caregiving career. The model is illustrated in Figure 1. Caregiving does not occur in isolation from one's social and experiential past or present, thus it must be considered within this context. The construct of background/context is included to address the setting in which caregiving takes place, with emphasis on the social and economic characteristics of the family. In other works socioeconomic variables have emerged as key correlates of exposure to care related stressors, and socioeconomic resources may help to contain the extent to which a patient's condition becomes burdensome. A socioeconomic status (SES) factor can be determined using measures of parental education, occupation, and family income. In light of previous research, we hypothesize that higher SES will be associated with fewer child behavior problems [24, 48], fewer caregiving demands[16, 24, 48, 53], and improved psychological and physical health[9, 31, 39]. The child characteristics construct constitutes factors that are objective conditions of caregiving, i.e. they are manifestations of the child's impairment and thus constitute actual care demands. The literature has pointed to disability of the child and child behavior problems as key factors associated with caregiver health. Disability of the child measures motor severity and cognitive functioning, the extent of dependence in activities of daily living (ADL), and any additional medical problems. We hypothesize that less severe disability will be associated with better psychological and physical health [5, 9, 11, 54, 55], lower ratings of caregiver demands, and more positive parental perception of formal services as being family-centered[24, 57]. Measures of child behavior problems assess behavioral issues such as conduct disorders, hyperactivity, emotional disorders, and somatization. These behaviors require surveillance, control and exertion on the part of the caregiver. We hypothesize that fewer behavior problems will be associated with higher caregiver self-perception, and better psychological health[24, 58]. Factors considered under this construct are caregiving demands and perception of formal care. Caregiving demands measure the daily demands on the caregiver, as well as conflict between the caregiving role and occupational roles of the primary caregiver. We hypothesize that fewer demands will be associated with higher scores on measures of self-perception such as mastery and self-esteem, and increased levels of social support[56, 59, 60]. Perception of formal care measures the extent to which caregivers report formal services as being family-centered. We hypothesize that higher scores on this construct will be associated with better psychological and physical health. The Intrapsychic factors construct pertains to the caregiver's internal state. For most individuals, caregiving constitutes a new social role; identification with the role often coincides with role incumbency and with the development of self-evaluation of how well one performs the role. Self-perception is thus considered an important intrapsychic factor. Self-perception can be indicated with measures of the caregiver's self-esteem and sense of mastery over the caregiving situation. We hypothesize that higher levels of self-perception will be associated with higher perceived levels of social support[33, 37, 61], better family functioning [62–64] and higher use of stress management strategies[35, 65, 66]. People differ in their access to and use of coping factors. Previous research has shown that the factors included under this construct – social support, family function, and stress management – may serve as constraining resources with respect to caregiver health outcomes [9, 16, 24, 27, 31, 38, 40, 41, 43, 46, 67]. Social support measures informal support derived from the social relationships of the caregiver with extended family, friends and neighbors; family function measures the extent to which a family works as a unit; and stress management measures the number of strategies and practices of the caregiver in response to problematic situations. We hypothesize that higher scores on social support, family functioning, and stress management will be associated with better psychological health[9, 16, 24, 27, 38, 40, 46, 67]. In addition, we hypothesize that higher scores on social support and family function will be associated with greater physical health of the caregiver[16, 41, 43]. The two health outcomes considered in the proposed models are psychological health and physical health. Psychological health measures distress and depression in the caregiver. In a cross sectional study with caregivers of children with cerebral palsy, the proposed model (Figure 1) will use a single comprehensive Structural Equation Model (SEM) to examine simultaneously the five major constructs described in this paper and thought to be relevant to the health of caregivers. SEMs are primarily representations of causal relationships between hypothesized constructs, rather than just the simple associations between those constructs[69, 70]. Each arrow in the model is therefore meant to indicate not simply an association between variables, but rather a theoretically-derived representation of the causal nature of that association. Our future research will therefore serve to test the proposed empirical model, and provide an example of a study that may be conducted under this new framework. Our current research efforts are directed at testing this proposed model by conducting a cross-sectional study on caregivers of children with cerebral palsy. This paper outlines the variable measures and indicators that we have chosen for our study, which are congruent with our theoretical model. Future studies using longitudinal data under this theoretical model could potentially provide many answers to the puzzles of caregiver health. The dynamic nature of the caregiving career might then be addressed empirically, which would help to provide insight into what stages are actually experienced by caregivers, and how these stages and the transitions between them can be made easier, potentially reducing the probability of negative health outcomes related to specific points along a dynamic continuum. Conducting a longitudinal study under the guidelines of the proposed model would therefore allow for increased specificity when determining the measures and assistance that should be implemented to relieve caregiver burden. This conceptual paper documents the state of current knowledge, examines the current thinking that has been used to describe the caregiving process from two diverse but related fields – pediatrics and geriatrics, and proposes a comprehensive model that can guide future research in this area. Dr. Raina holds a Canadian Institutes of Health Research (CIHR) Investigator Award, Dr. Rosenbaum holds a Canada Research Chair in Childhood Disability from CIHR and Dr. Walter is a CIHR Scientist.